سازه هایی که با فناوریهای ساندویچی تولید می شوند دارای خواص مکانیکی منحصر بفردی از قبیل جذب انرژی بالا و وزن پایین می باشند. بنابراین در صنایع حمل ونقل (خودرو سازی، صنایع هوایی و کشتی سازی) که اصول سبک سازی و ایمنی وسایل نقلیه حائز اهمیت است، کاربردی فراوانی دارند. از آنجاییکه سازه های ساندویچی با هسته پلیمری سالهاست که مورد استفاده محققین قرار گرفته ، اخیراً توجه ویژه ای به استفاده از سازه های ساندویچی با هسته فوم آلومینیومی شده است. 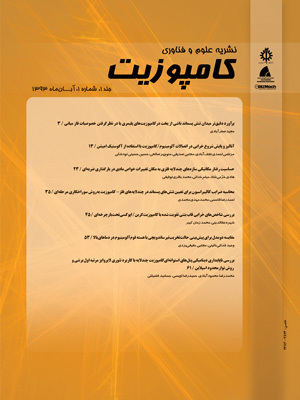 درتحقیق پیشرو به تحلیل رفتار صفحات فوم آلومینیومی ساندویچی در دو نوع رویه بهم پیوسته و رویه مجزا در برابر بار ضربه با سرعت پایین و همچنین بررسی شکل شکست آنها با استفاده از تصاویر مقطع نگاری رایانه ای پرداخته شده است. همچنین یک روش تئوری بر مبنای مدل موازنه انرژی برای بررسی رفتار ضربه ماده با استفاده از پارامترهای اندازه گیری شده از تصاویر مقطع نگاری نمونه های پس از ضربه، بکار گرفته شده است. تجمیع نتایج تئوری و آزمایشگاهی حاکی از آنست که تخریب نهایی و شکست کامل پانل های ساندویچی آلومینیومی در مقایسه با پانل های ساندویچی پلیمری، دارای گستره کمتر و نمونه های سالم تری پس از ضربه بوده و در نتیجه خواص مکانیکی و عملکرد آنها پس از ضربه بهتر خواهد بود. The structures realized using sandwich technologies combine low weight with high energy absorbing capacity, so they are suitable for applications in the transport industry (automotive, aerospace, ship building industry) where the “lightweight design” philosophy and the safety of vehicles are very important aspects. While sandwich structures with polymeric foams have been applied for many years, currently there is a considerable and growing interest in the use of sandwiches with aluminum foam (AFS) core. The aim of this paper was the analysis of low-velocity impact response of aluminum foam sandwich panels in two different types (integral skins and bonded skins) and the investigation of their collapse modes using computed tomography (CT). A theoretical approach, based on the energy balance model, has been applied to investigate their impact behavior and the model parameters were obtained directly from the measurements carried out on CT images of the impacted sandwiches. The AFS structures are relatively intact compared to the more catastrophic and localized fracture of the polymeric sandwiches, so the mechanical properties and their performance after imact will be better than polymeric sandwiches. Abrate, S., “Impact on Composite Structures“, Cambridge University Press, 2005. Ashby, M. F. Evans, A.; Fleck, N.A. ; Gibson, L.J. ; Hutchinson, J.W. ; Wadley, H.N.G., “Metal Foams: A Design Guide“, Butterworth Heinemann: Burlington, 2000. Gibson, L. J. A., M.F., “Cellular Solids“ 2 ed., Cambridge University Press, 1997. Banhart, J. S., C.; Neumann, U. , “Light-Weight Aluminum Foam Structures for Ships“ in Proceeding of 55-63, 2011. Baumeister, J. B., J.; Weber, M, “Aluminum Foams for Transport Industry“ Material Design Vol. 18, pp. 217-220, 1997. Hazizan, M. A. C., W.J., “The Low Velocity Impact Response of Foam-Based Sandwich Structures“ Composites: Part B Vol. 33, pp. 193-204, 2002. Crupi, V. E., G.; Guglielmino, E., “Low Velocity Impact Strength of Sandwich Materials“ Journal of Sandwich Structure Material, Vol. 13, pp. 409-426, 2011. Crupi, V. E., G.; Guglielmino, E., “Computed Tomography Analysis of Damage in Composites Subjected to Impact Loading“ Fracture and Structure Integrity, Vol. 17, pp. 32-41, 2011. Olurin, O. B. A., M.; Körner, C.; Singer, R.F. , “The Investigation of Morphometric Parameters of Aluminum Foams Using Micro-Computed Tomography“ Material Science Engineering, Vol. 328, pp. 334-343, 2002. Wicklein, M. T., K, “Numerical Investigations of the Elastic and Plastic Behavior of an Open-Cell Aluminum Foam“ Material Science Engineering, Vol. 397, pp. 391-399, 2005. Chengjun Liu a, Y. X. Z., L. YebHigh, “Velocity Impact Responses of Sandwich Panels with Metal ﬁbre Laminate Skins and Aluminum Foam Core“ International Journal of Impact Engineering Vol. 100, pp. 139-153, 2017. Pengfei Wang a, b., Songlin Xu a,n, Zhibin Li a, Jinglei Yang b, Hang Zheng a, Shisheng Hu, “Temperature Effects on the Mechanical Behavior of Aluminum Foam under Dynamic Loading“ Materials Science & Engineering A Vol. 599, pp. 174-179, 2014. Kavei, G., “Mechanical Properties of Aluminum Foam Fabricated by Aluminum Powders with Na or Carbamide Replica“ AASCIT Journal of Material, Vol. 1, No. 2, pp. 22-30, 2015. Lorenzo Peroni, M. A., Marco Peroni, “The Mechanical Behavior of Aluminum Foam Structures in Different Loading Conditions“ international Journal of Impact Engineering Vol. 35, pp. 644-658, 2008.